It was announced in November 2014 that the Lost Vikings, the befuddled trio of puzzle-solving Norsemen created by Blizzard—then known as Silicon & Synapse—in 1992 for the SNES, would at some point be coming to Heroes of the Storm. And now, as part of yesterday's big update to the closed beta, they're finally here. "The Lost Vikings are an iconic triad from the early days of Blizzard’s history, and in Heroes of the Storm, they are three specialists in one, who each have their own unique strengths and abilities," Blizzard wrote in The Lost Vikings Hero Week announcement. "This triple trouble trio is just the rowdy bunch you’ll want by your side when you take it to your foes in the Nexus!" 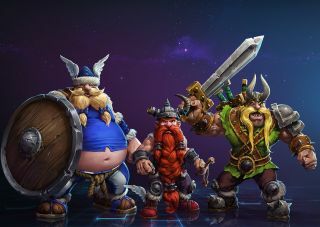 While each of the Lost Vikings wielded his power individually in the original games, they'll work cooperatively in Heroes of the Storm, spinning, jumping, and bulking up with "Norse Force." They'll also have the ability to embark upon Longboat Raids, firing a cannon and long-range mortar at their enemies, and any one of them can raise and rally the others when they fall. "Erik, Baleog, and Olaf are three heroes in one! They’re specialists who represent our first 'Insane' difficulty heroes in the game and as such, they can be controlled individually or in groups, allowing players to do truly insane things like maintain presence across up to three lanes at once, and even have the potential to complete battleground objectives like capturing the Dragon Knight all by themselves," Lead Game Producer Kaeo Milker explained. "Players' success with the Vikings will be dictated by their ability to effectively manage the positioning, attacks, and abilities of all three characters simultaneously, and we can’t wait to see what players do with them now that they’re live in the game." Milker said that one of the great things about Heroes of the Storm is that it can incorporate anyone or anything from Blizzard's history. But the Lost Vikings, as the studio's "original heroes," were a particular favorite among both fans and developers, and in fact were the most-asked-for heroes since the game was announced in 2013. "The Vikings were heroes we knew we wanted to do, and we were very clear on our desires to make them micro-manageable from early on," he added. Unfortunately, the addition of the Lost Vikings to Heroes of the Storm is not a hint that a new Lost Vikings game is in the works. "Our team is focused entirely on Heroes of the Storm and StarCraft II: Legacy of the Void right now, so sadly no plans from our end," Melker said. The original game, however, is still available as a free download from Battle.net.